You don’t always have to take your dog or cat to the groomer. 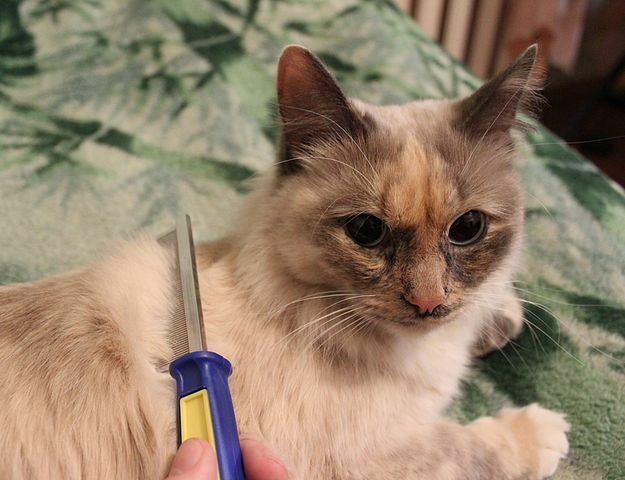 If you have the best brushing and combing pet tools, you can definitely do most of the basic tasks yourself, at home. A shedding blade is ideal for harsh types of coats. The choice of brushes and combs is quite extensive so it’s necessary to know the best ones to pick depending on the type of coat your pet has. Each has a specific purpose and won’t disappoint if used correctly. Did you know that grooming pets brings benefits of another kind? In fact, in this blog we’re not just discussing an enhanced and visually pleasing exterior appearance. Regular brushing, combing, trimming and bathing will, of course, keep your pet clean, matt-free, and help reduce the likelihood of external parasite infestation. On top of that, these actions assist in minimizing the amount of fur your dogs and cats can dump in your home, on floor surfaces and furniture. Grooming pets brings benefits such as improved blood circulation. So, grooming has below the surface benefits, too. And by that I mean they can promote general well-being as well as detect health risks. By passing your hand over the skin and doing a visual examination before brushing, you can notice things you may not otherwise. For example, scratches, skin issues, swelling and lumps that may require veterinary attention. In addition, when you touch a limb from top to bottom, you may notice tenderness which could be an indication of arthritis or injury. You may already know this but it’s worth highlighting here. The action of brushing actually stimulates blood circulation and helps the secretion and distribution of natural oils. 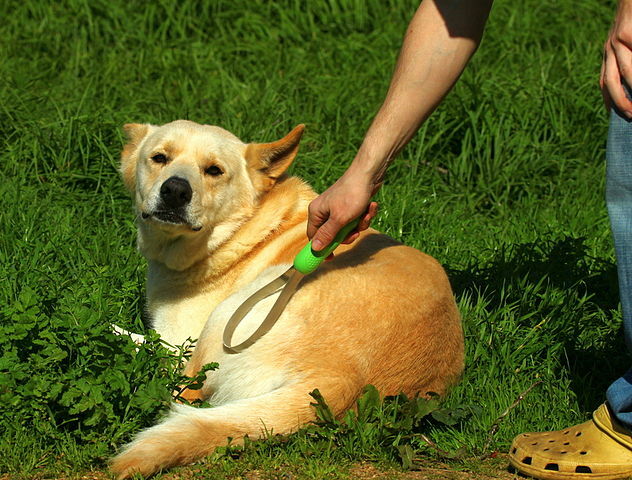 As a result, your pet’s skin gets a health boost and a nice, shiny coat. A metal comb is particularly useful in sensitive areas. The selection is extensive and what you’ll see at your local pet store are at-home grooming tools. They cater to the needs of all breed types and the diversity of coats they exhibit. Most online pet stores have helpful descriptions of the products they sell. Consequently, it’s a lot easier for pet parents to choose the best items for the job at hand. To give you an idea of what these tools do, here’s a list for quick reference. 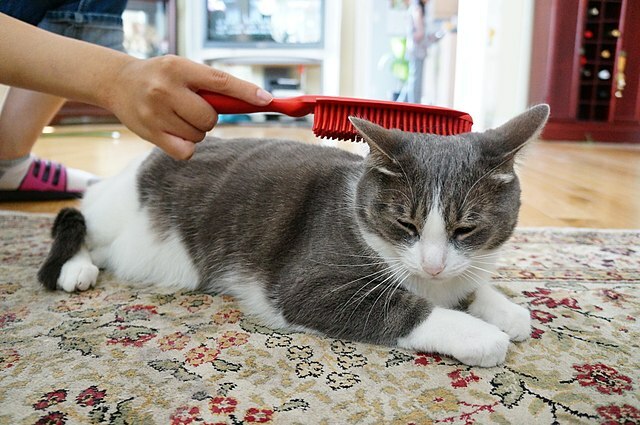 Cat being groomed with a long-handled rubber brush. Bristle Brushes are widely used for all coat types. They remove surface debris and leave a nice shine on long-coated dogs. The Slicker Brush has rows of thin wire pins which are good for dematting, detangling and removing loose fur. It’s ideal for long and curly coats. Pin Brushes are similar to the slicker brush but have plastic or rubber tips on the wire pins for a gentler brushing experience. They are very practical for wavy and curly coats. The Undercoat Rake has longer, fewer pins than a pin brush. 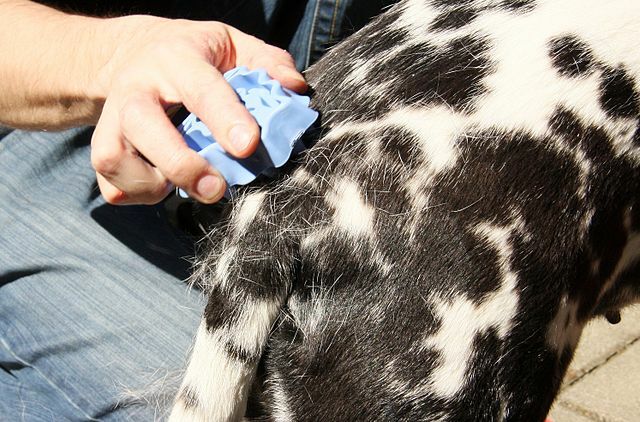 This device is designed to untangle and remove dead hair from the lower layer of double-coated dogs. The short rubber teeth can remove large amounts of shedding hair. Similar in style to the brush used for horse grooming, the Curry Brush is ideal for most short-haired dogs. When gently rubbed over the coat, its short rubber teeth loosen dirt and are able to remove large amounts of shedding hair. Grooming Gloves are currently getting a lot of publicity and pet parents find them very practical. They can be used on both dry and wet coats in long, firm strokes, typically to drag off loose hair from short-coated dogs. 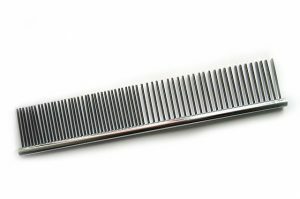 The very basic Metal Comb helps manage tangles and is particularly useful in sensitive areas such as the ears, toes and tail. Some styles even have teeth with rounded tips for extra safety. Flea Combs, used mostly for cats, feature narrowly spaced teeth for the effective removal of live and dead fleas as well as their eggs. Areas worthy of special attention are the face, neck and just in front of the tail. 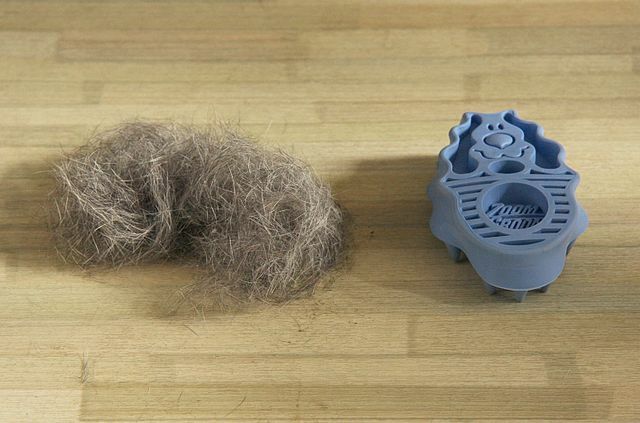 The FURminator is a patented, highly effective de-shedding tool. 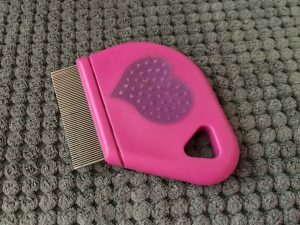 It comprises a metal comb with a button to release the collected fur, and works on nearly all coat types. A Shedding Blade is a curved metal strip where the two ends join together at the handle. The lower edge has zig zag teeth and as you drag it across the flat, short or combination harsh types of coats, it effectively removes loose hair. 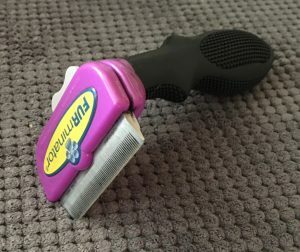 Now that you have a better idea of what’s out there, you are in a position to choose the best brushing and combing pet tools, that are perfect for grooming your dog and cat at home. And, not only that, think of the health benefits it provides and the enjoyment of bonding even more with your furry companions.